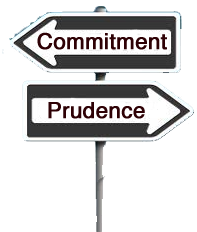 While “The Prudent” allow themselves to be distracted by emails, Facebook, Wolf Blitzer and the negative news of the day, “The Committed” allow themselves to be consumed with their art, engulfed in their work and overrun with too many creative ideas. While The Prudent remain confused about the economy and anxious about the future, The Committed are at work growing their company, upgrading their websites and investing in exciting new ventures. While The Prudent get hooked by the petty politics of the day, The Committed are busy making tough choices, confronting impossible decisions and taking big risks. While The Prudent complain about how hard it is to make it, “especially in these tough times,” The Committed get their hands dirty; designing new products, placing new songs, publishing new books and writing inspiring screenplays. While The Prudent scratch their heads and wonder what to do next, The Committed step out onto the skinny branches and form partnerships, make agreements, sign contracts and cash checks…often BIG ones. And while The Prudent pause at the end of the day to admire their prudent work, The Committed work to improve theirs.